Webilent provides a structured approach to your application development, system implementation, process re-engineering and other project based requirements. 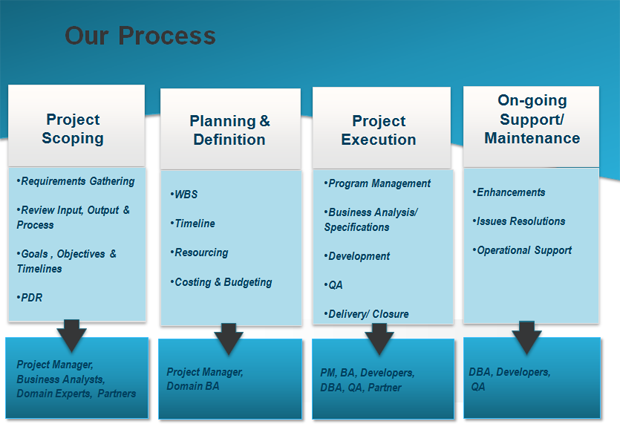 Our four step methodology includes scope definition, project execution, resourcing, project governance and on-going monitoring and maintenance. We bring in the appropriate resourcing during each step of the process to ensure maximum impact at the lowest possible total project cost. Our expertise can also be employed to perform project rescue operations. Webilent can evaluate status, recommend a new path, and execute the completion of project already underway. Our flexibility allows us to take on entire projects, specific work streams within projects, or provide in-demand skills as described under our staff augmentation capabilities. Webilent's team of highly qualified consultants is available to support your resourcing needs for projects as well as on-going operational support. Our structured approach, and combination of technical and business skills allows us to participate in projects managed by someone else, with minimal supervision. Our wide array of expertise allows us to provide support for common skills as well as skills that are hard to procure. Please refer to the OUR EXPERTISE page for details on the support we can provide. Webilent provides on-going maintenance and operational support based on support contracts. On-going support agreements include systems and applications commissioned by you, third party applications, and infrastructure support.